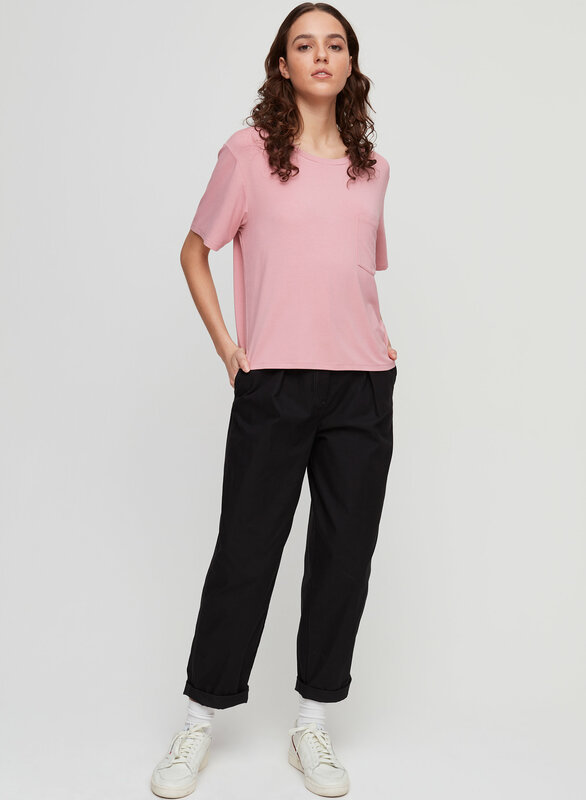 Styled with day-off pant . You guys are going to be so cute together. 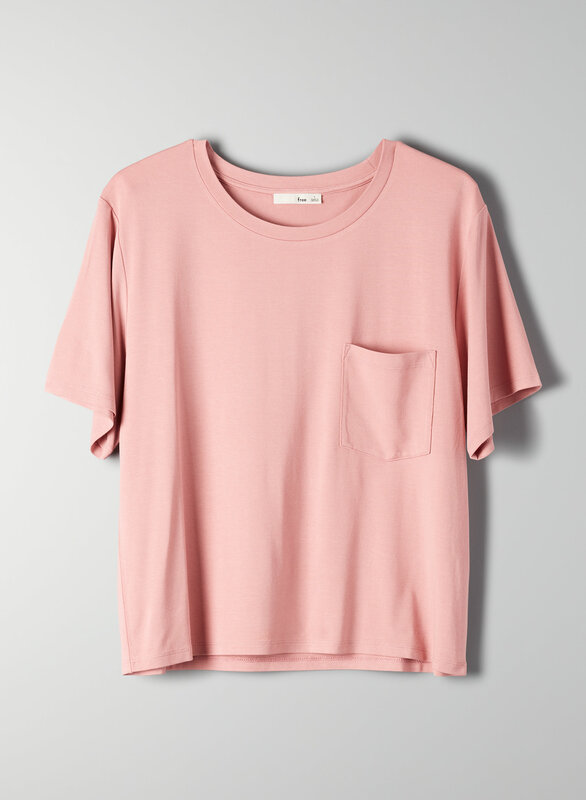 This is an crewneck t-shirt with an essential boxy silhouette and a pocket. It's cut from drapey fabric with a cool feel. Bought this shirt in several colours. Love the fit and the cool, airy feel; looks great with jeans and also nice for a light workout. bought 2 of this shirts, and love how comfortable they are! thinking of grabbing more. This T-shirt has a free style design. A bit boxy-personally wouldnt purchase again. 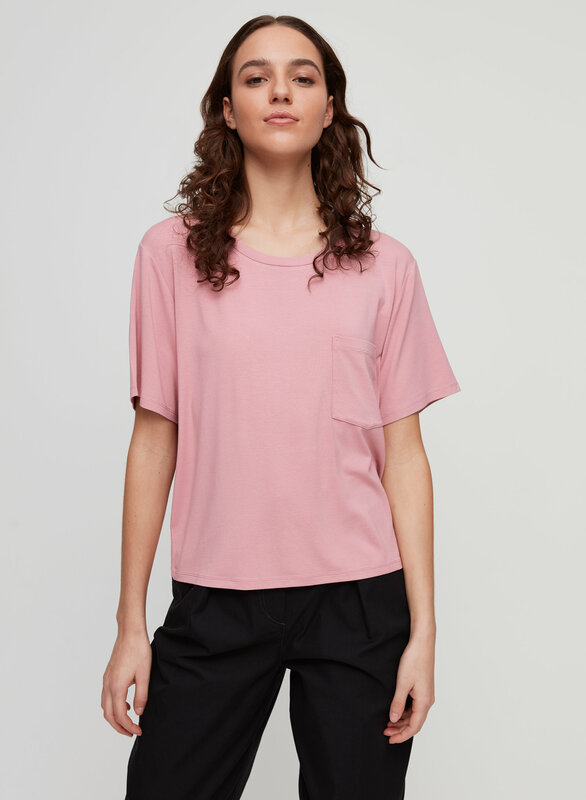 I really like the colour of the shirt and the general shape. Its great that you can roll the sleeves. It falls nothing like on the model. The fabric is thick and makes it boxy. I would not purchase again. It was a waste of money because its really not as flattering as I would have liked. I generally wear a small or medium in shirts. I like a looser fit. I got it on sale so sending it back wouldnt really have been worth it as I would have lost the 8 dollars shipping so only received 11 dollars back. I do not usually write reviews but for this t-shirt I will. I own many white Tees but this one is my FAV. It is PERFECT. It is meant to fit a little oversized. It is so soft, perfect weight, flowy, not see thru, it will not pile up, and it is so flattering. LOVE this tee. it fits a bit big but it's made of heavy fabric that makes for a really flattering drapey look and is never see-through. I’ve been looking for the perfect white t-shirt for a year and this is it. 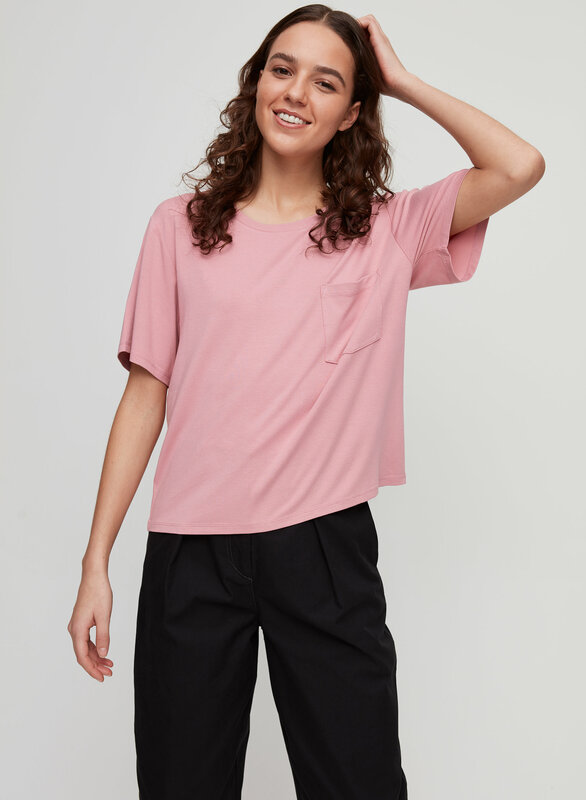 Lovely soft fabric that is the perfect weight, not heavy but not super thin. Loved it so much I got another in black. Love the sleeve length, not too cropped so I can lift my arms without exposing my belly button. Fabric is not typical tshirt, a little thicker than usual but drapes nicely, hence the price tag. Don't know how it'll wash, but I expect fine if I follow the tag and don't put it on the dryer. I said it for slightly larger, but I prefer that over too small for this style. 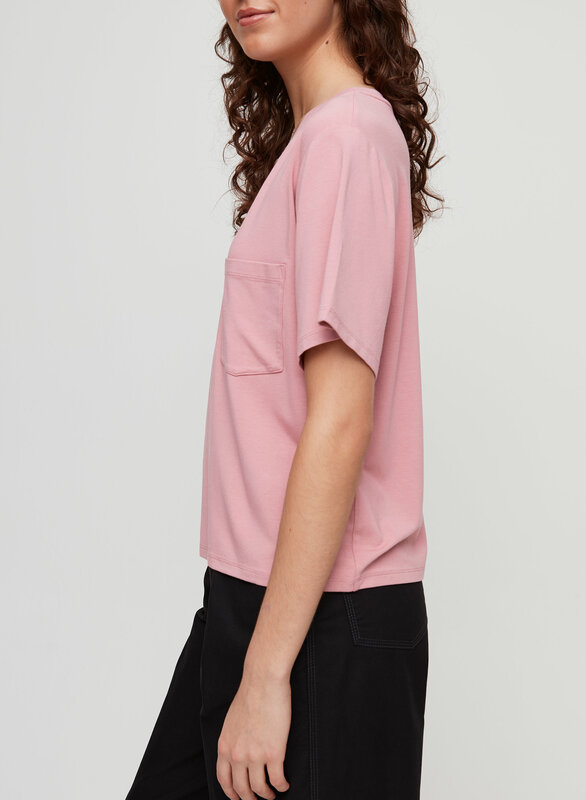 This is a perfect cropped tee.. not too short. I liked that it was slightly over sized and the material made it fit nice. I am normally a large but I had to get a small in this specific tee. It is a bit pricey but it is form fitting but loose at the same time. I love it!